Modern life is complicated. We are freer than ever to pursue our dreams, but great friends, a challenging job and an ideal home are a lot to juggle. 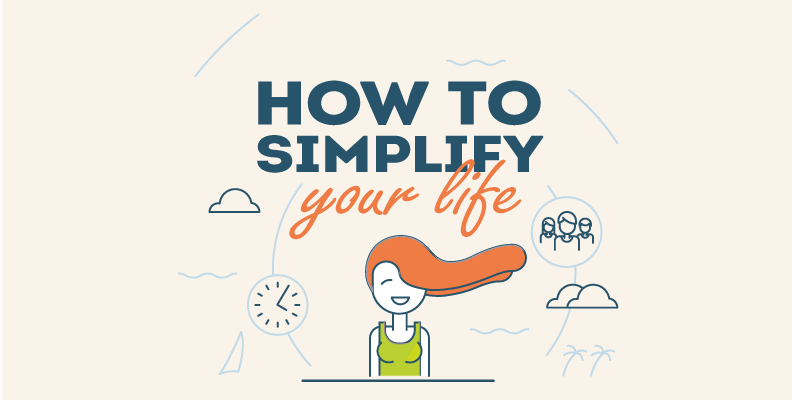 How can you simplify your life without losing out on the things you love? You may feel guilty because you don’t spend enough time with your family. Or maybe your house is such a mess that you dread going home after work. If the key elements of your life are stressing you out, it’s time to remedy the problem. It’s easy to fall into bad habits at work. Putting some time aside to plan your schedule at the beginning of the day will empower you to be a better employee. It’s okay to say no to extra work if you can show that your plate is already full. Removing that unnecessary work stress will benefit all areas of your life. It will also feed back into your professional performance in the long run. If you find that Facebook and other social media apps have made your social life overwhelming, try limiting the interactions and time you spend on them. If you must log on in the evening, think carefully about how you spend your time. Try to avoid contact with negative people. Instead check in with your friends, browse some pictures or watch a short, funny video or two. Our new infographic makes it easy to identify which elements of your life are causing you stress and offers some simple solutions for each potential problem. With just a pen, some paper and a quiet moment to think, you can start simplifying your life today!